What better way to try calling baseball than at the minor league level? 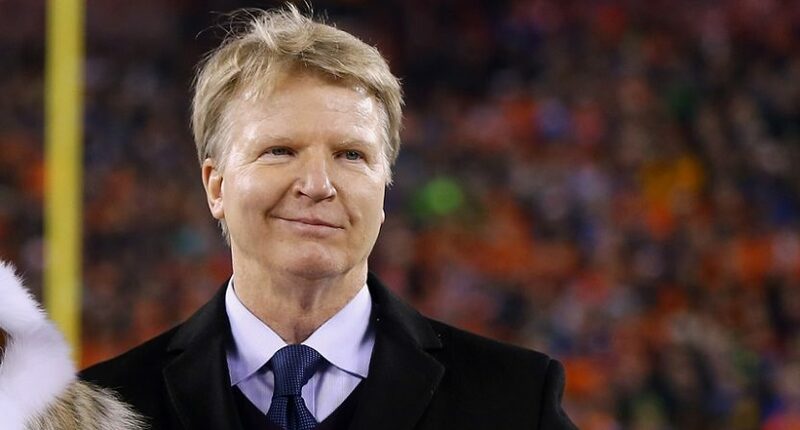 Phil Simms insists his broadcasting career isn’t over after CBS booted him in favor of Tony Romo from the network’s top NFL announcing team with play-by-play man Jim Nantz. While Simms considers his next move — which could be a move to the CBS studio team, a step down to the “B” broadcast booth or perhaps even a move to New York sports talk radio — one sports team has offered him the opportunity for a soft landing, albeit only for one game. RoughRiders general manager Jason Dambach sounded hopeful in the official announcement. As far as we know, Simms has no experience calling a baseball game at any level. But Double-A, with a broadcast streaming on MILB.TV, seems like a good place to start. The RoughRiders’ announcement didn’t indicate how current broadcasters Ryan Rouillard and Keith Raad feel about the offer, especially the uncertainty surrounding if or when Simms might accept the invitation. But the two are presumably fine with the possibility of working with an experienced TV analyst like Simms (and the team would probably give them no choice). After Sunday’s home opener, 139 games remain on the RoughRiders’ schedule, so Simms has plenty of time to choose a game between now through September. Of course, it would be all kinds of cool — and funny — if Simms accepted the RoughRiders’ invitation. The estranged analyst could show he has a sense of humor about a publicly embarrassing situation and doesn’t take himself too seriously. That often goes a long way toward endearing yourself to people and getting them to root for you. However, it would also be an acknowledgment of what’s surely been a humiliating experience for Simms. Even being in on the joke would draw attention to something Simms would likely prefer everyone quickly forgets. In the meantime, the RoughRiders, media observers and broadcasting fans will be on watch. Could Simms’ next move be a small broadcast booth in Frisco, Texas?